The following is the No. 9 – 7 countdown of Pac-12 schools, part of Chris Charbonnier‘s ongoing special report for FishDuck.com. In case you missed the introduction, you can find it here. It will give you some good background, and clue you into the formulas being used below. 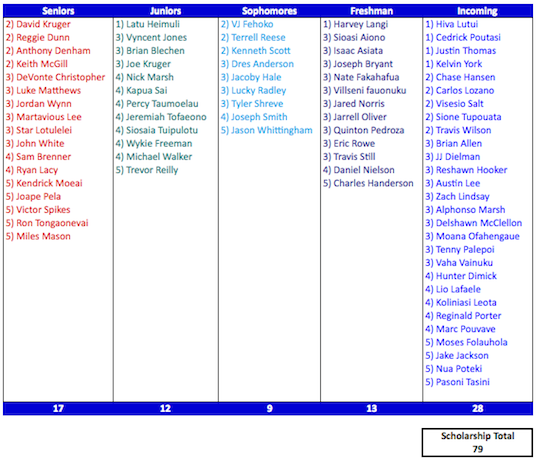 Note that all rosters are works in progress, as teams have not yet released official 2012 rosters. You’ll see that some rosters are over the 85 scholarship limit, but this is only because there’s attrition that either 1) I don’t know about or 2) hasn’t been made public (if this were the SEC there would be a 3rd option, but we won’t go there). The current state of this team is the product of an inability to meet expectations in recruiting. The fact that Arizona only has ten E-2 players is shocking when you consider the number of D1 players coming out of the state and the school’s proximity to southern California. Talent level aside, it was off-the-field issues last year that broke the camel’s back and crushed Mike Stoops. With Rich Rodriguez and his spread offense coming on board this year, there’s hope in Tucson, if for no other reason than his ability to bring in higher quality talent than Stoops was able to. 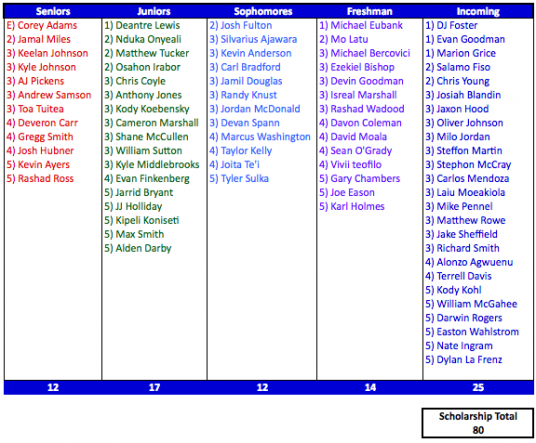 Note that only 77 scholarship players are listed above, and whether there are some walk-ons who earned scholarships or Rich Rod simply wanted to save those spots for next year, I don’t know. Assuming the latter (there’s only ten scholarship seniors on the roster), Rodriguez will have the opportunity to greatly improve this team’s talent level with the 2013 class if he can generate interest in the program. I wouldn’t be surprised if that becomes a reality. USC is on sanctions still, and recruits are looking for a reason to stay close to home. An exciting offense could be the push some of those Arizona athletes need to stay in state. Looking at the 2012 schedule, ‘Zona has a chance to compete for a bowl game, but not much more; at least not right away. Unlike the three teams below it in the rankings, Arizona has a real chance to move up in the coming years. Rich Rodriguez could end up being very successful in this conference and I won’t be surprised to see huge improvements in recruiting. 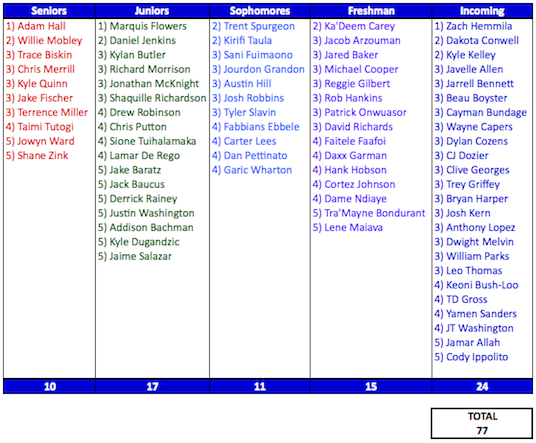 The 2012 class was far too average. The ceiling is too high to barely get off the ground. Look for the team to struggle in Rich Rod’s first couple of years as they transition to a new system without the adequate talent necessary to make it successful. However, they should make significant strides in the process. I see this as a team on the rise. Arizona State’s current situation is a familiar one: desirable location, lack of talent, on-field struggles and a new head coach. Remind you of anyone? While ASU might be in slightly better shape than UA, they aren’t even close to threatening USC in the south. There’s definitely some talent on the roster, but there’s a lot of fat too. Todd Graham has some work to do on the recruiting trail if he wants to compete at a high level in the PAC12. The direction this team heads is anybody’s best guess. It’s unlikely that significant on-field improvement will take place for at least a couple of years. It’s also unlikely that this team will be terrible, given their talent edge over teams in the bottom third of these rankings. That leaves them in no man’s land, fighting for a lower-tier bowl game. It’s a matter of high expectations overshadowing the talent reality, which will always lead to disappointment. Arizona State has a very high ceiling. If Chip Kelly had done in Tempe what he did in Eugene, the Sun Devils would have a top-10 recruiting class every single year. So, if Graham can turn this program around, it could do a complete 180 and be a consistent conference contender. Don’t put me on the bandwagon, though. This isn’t a team that’s talented enough to compete with the Trojans or the Ducks, and the only realistic way that changes, outside of bringing in a system coach, is to improve recruiting over the next few years. If they can build on a solid 2012 class, it’s possible. For the meantime though, look for Arizona State to remain a low-level bowl team. Utah’s move to the PAC12 proved to be a good one on the recruiting trail. Their E-2 talent doubled, which is a great sign moving forward. This is a team that sits on an even talent-level footing with the bottom half of this conference, but the 2012 class shows that the Utes could pull away from that pack in the future. An interesting team to watch closely over the next few years. In the near term, Utah will fight to finish in the middle of the conference standings each of the next couple years. There’s nothing holding them back from being a bowl team except for less-talented teams. Looking farther into the future, Utah needs to capitalize on its recruiting momentum. If the Utes can put together another couple of classes like the one they just assembled, they’ll be able to compete at a relatively high level and separate themselves from the bottom half of the conference. While they might not be able to compete with USC or Oregon consistently, upsets become easier the closer two teams are in talent. Utah could surprise people. With teams like Arizona, Arizona St. and UCLA in transition, look for Utah to take advantage this year and prove that they belong in the conference. Honestly, I was surprised that Utah was ranked this highly. This would’ve been the case even without a solid 2012 class. Becoming a member of an ATQ conference certainly helped recruiting, and that’s something Utes fans should be really excited about. What their ceiling is remains to be seen. Utah isn’t exactly a hotbed of talent, so that alone limits the team’s potential. Expectations should remain cautious, but it seems reasonable to assume that this could be a perennial bowl team that pushes for a top-4 conference finish every year.